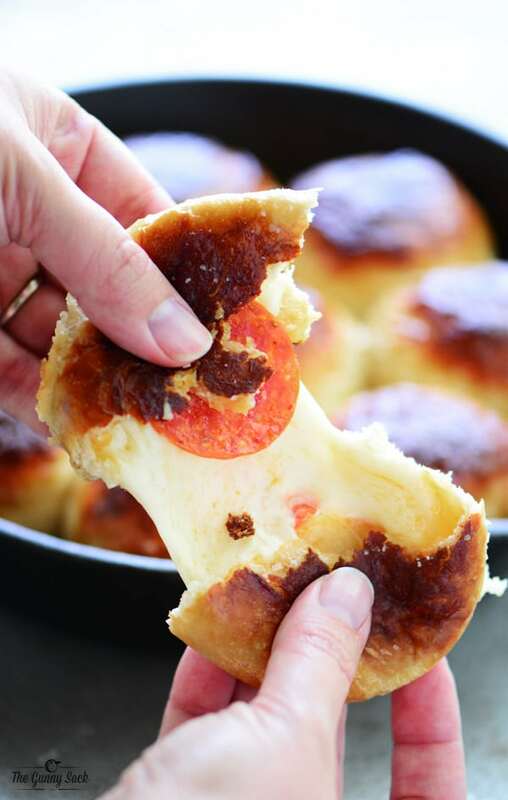 This Pepperoni Pretzel Balls recipe has a soft pretzel surrounding pepperoni and cheese. They’re perfect for an after school snack or a party appetizer. I’ve been making my easy pepperoni rolls recipe for years now and my kids love it but since they have a slight obsession for soft pretzels, I decided to combine the two to make these Pepperoni Pretzel Balls. They have a buttery, salty, soft pretzel on the outside with pepperoni and melting cheese on the inside. Where is the Pepperoni Pretzel Balls recipe? In this post, I will share step-by-step instructions with photos for how to make this easy meal, as well as answering FAQs about the recipe and sharing a short video showing the recipe in motion. But you can go directly to the recipe by scrolling down to the bottom of the post. Cut an eight-ounce block of mozzarella cheese into eight one-ounce cubes and set them aside. 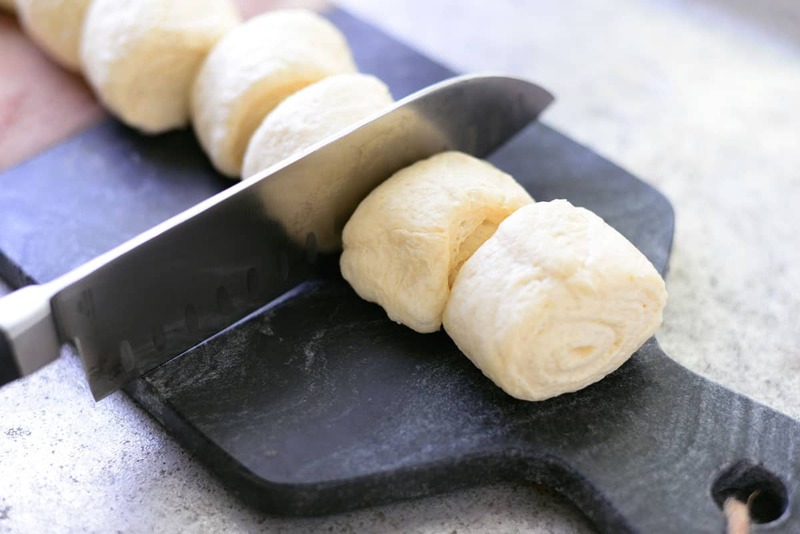 Cut a loaf of refrigerated bread dough into eight slices. You can also use refrigerated biscuits or the homemade dough recipe in this blog post. 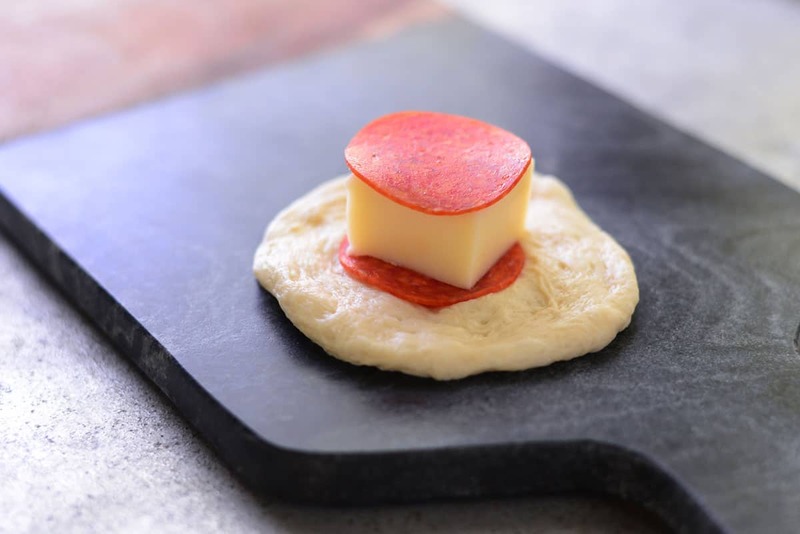 Flatten a piece of dough and top with a slice of pepperoni, a cube of mozzarella cheese and another slice of pepperoni. 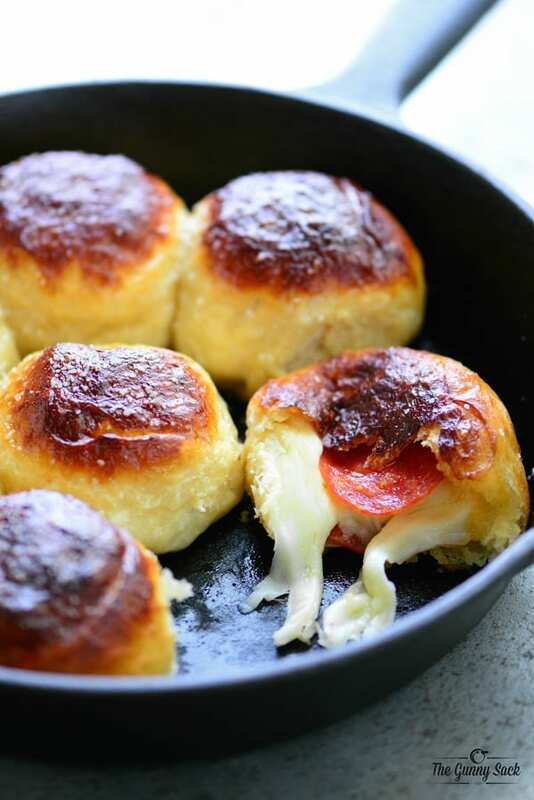 Wrap the dough around the cheese and pepperoni and pinch together at the top. 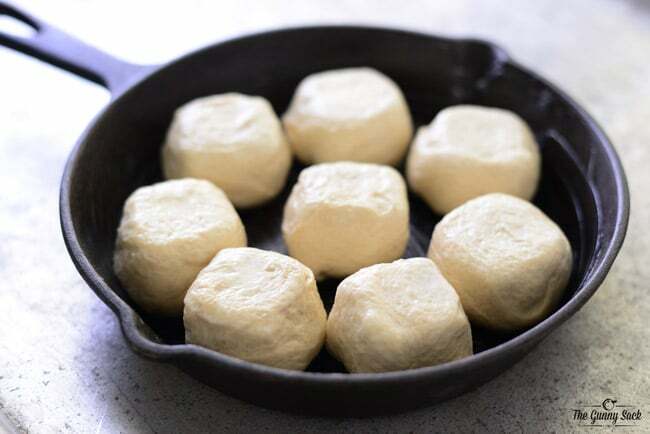 Dip the balls in the baking soda mixture and place them in a greased 9-inch cast iron skillet or oven-safe baking dish. Bake at 400˚F for 12-17 minutes, until golden brown. Brush with melted butter and sprinkle with coarse salt. Make sure you enjoy these Pepperoni Pretzel Balls while they are still warm. What could be better than a buttery soft pretzel filled with melted cheese and pepperoni? This recipe could easily be doubled to fit into a 9×13 inch pan or a large cast iron skillet for those times when you need more servings. 1. Why do you dip them in the baking soda/water mixture? The baking soda and water mixture is what gives the pretzel flavor and golden outside of the pretzel balls. 2. 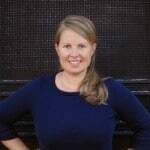 Can I skip the baking soda/water mixture? Yes, but the flavor will not be the same. 3. Can I brush them with beaten egg white instead of dipping them in the baking soda and water mixture? Yes, but again, the flavor will not be the same. 4. What can I use instead of a loaf of refrigerated bread dough? You can use refrigerated biscuit dough (such as Pillsbury) or the homemade dough recipe in this blog post. 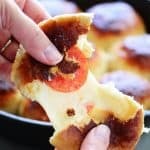 These Cheese Bombs are cheese-filled biscuits with a deliciously crunchy coating and warm, melted cheese on the inside! This appetizer recipe for Chili Cheese Skillet Dip with Garlic Cheese Bombs is perfect for serving at parties! Cut dough into 8 slices. 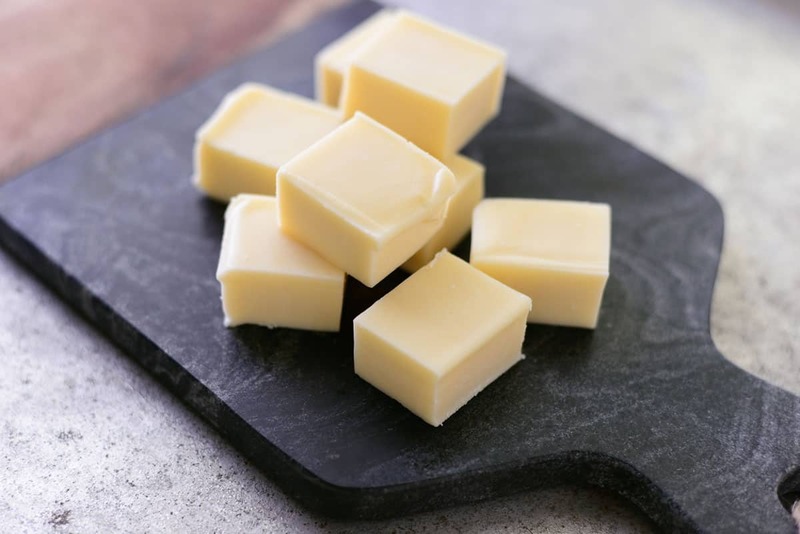 Cut the block of mozzarella cheese into 8 cubes. Flatten a piece of dough. Top with a slice of pepperoni, mozzarella cheese and another slice of pepperoni. Continue with all of the dough pieces. Mix together hot water and baking soda. 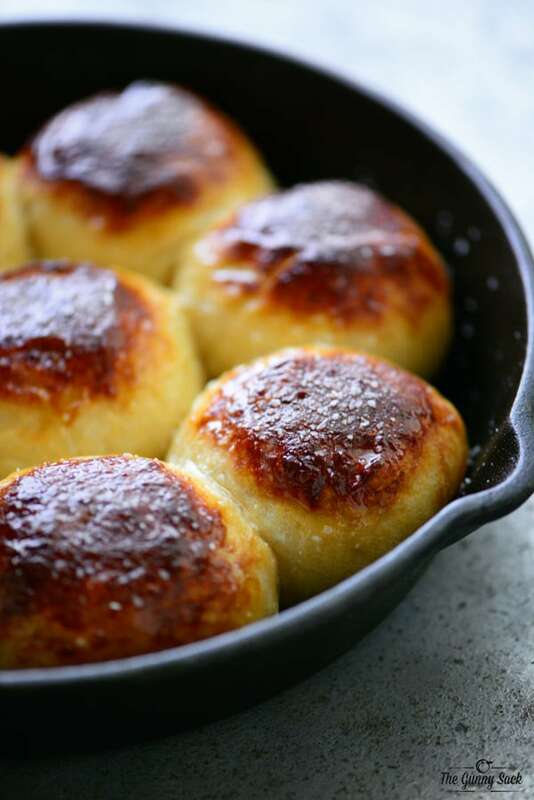 Dip filled dough balls into the baking soda mixture. Place them in a greased 9-inch cast iron skillet or oven-safe pan. Bake at 400 degrees for 12-17 minutes, until golden brown. Brush with melted butter and sprinkle with salt. I didn’t know that either but it’s how we all learn and then enjoy. These were yummy but dipping mine in the sofa mixture made them fall apart and not stay open. Any ideas? Why the soda and water? Just curious. I am quite ignorant of the pretzel world! Alot of us are but, it’s how we all learn. OK..I think i am making these for supper!! Yes! I’m liking that idea! Thanks Rhonda!